Maria Elia pays homage to the flavour of the humble vegetable in this good-looking book. One of my favourite things about the book is the way she builds the depth of vegetable flavours into her recipes, using the veg themselves rather than seeking to impose flavour from outside. She pays great attention to the use of stock in many of the recipes, with a couple of stock recipes at the end and sometimes making it on the run with the peelings of the main veg in a recipe. My favourite example of this is in the parsnip risotto, a dish perfect for cold weather comfort food. I always seek out the simplest recipes in any book and her chapter on side dishes scores strongly here, coconut basmati rice and braised broad beans with lemon and dill for example. A lot of the main dishes are what I would call restaurant food with up to 5 sections to a recipe, building a meal out of various parts. These are definitely special occasion meals only. 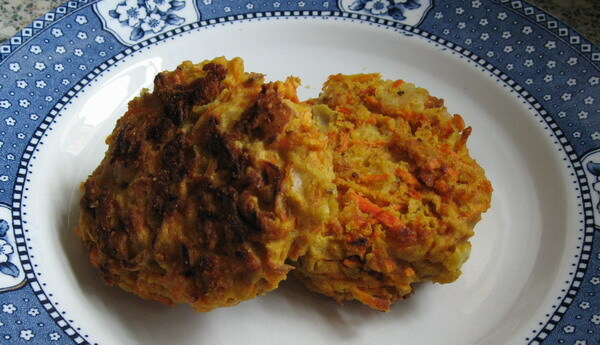 My favourite recipe so far is for carrot pancakes. The full recipe is for carrot pancakes with houmous and a feta salad, another complicated recipe which she describes as ‘perfect for a light lunch, snack or starter. It also makes great party canapes’. Well, I’m not sure I have the time for all of that, but the pancakes on their own are simple and really tasty. Mix all the ingredients, except the olive oil, together to form a thick batter. Heat the oil in a small non-stick frying pan until hot, then spoon in a quarter of the batter and fry until golden on both sides. Repeat with the remaining mixture to make 4 pancakes in total. I found the pancakes did stick, but that brushing them with oil and grilling them worked fine!